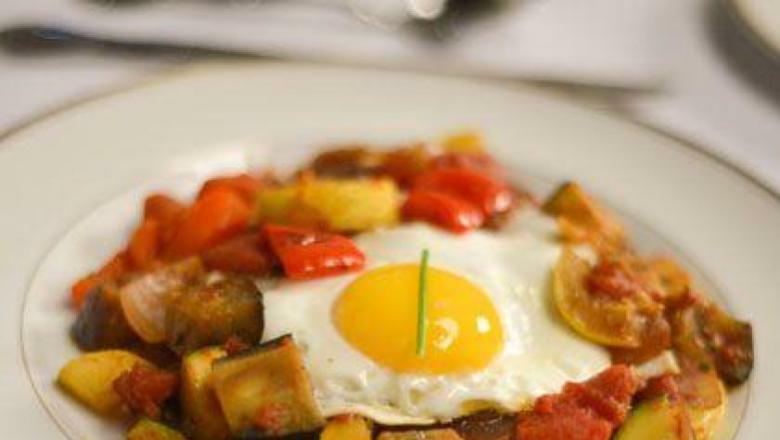 Start your week off right with this one pan breakfast dish. You can make the veggies ahead of time and make the eggs fresh in the morning. You can definitely make a hard boiled egg or a fried egg if you don’t have time to poach an egg. If you are looking to get some extra veggies in, this recipe can really bump up the veggie intake. Peppers, zucchini, eggplant and artichokes! Fantastic! Enjoy. 1) Heat the ghee or coconut oil over medium-high heat. Add the eggplant and cook, stirring occasionally, for about 10 minutes, until the eggplant is tender. Add the tomatoes and cook for about 5 minutes, until the tomatoes have begun to break down. 2) Add the bell peppers, zucchini, artichoke hearts, jalapeno, thyme, oregano and parsley. Stir to mix. Add the broth, salt and pepper and bring to a boil. Cover, reduce the heat to low and simmer for about 20 minutes, until the liquid has evaporated and the vegetables are tender. 3) While the vegetables are cooking, poach the eggs. Bring a pan of water about 3 inches deep to a boil over high heat. Reduce the heat to low, carefully break the eggs into the water and simmer for 4 minutes. 4) To serve, ladle the vegetable mixture into 4 serving bowls and top each with a poached egg.